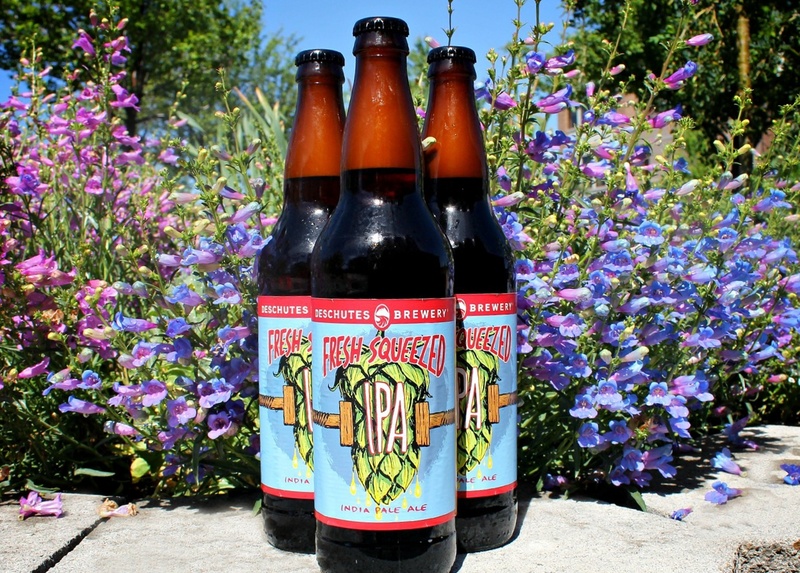 Forget ‘food-cations’ and instead, treat your tastebuds to a ‘beer-cation’ in Bend, Oregon. Never heard of it? Bend is a small mountain town located smack-dab in the middle of Oregon. The population is just over 80,000 at last count, but the number of people in town soars during the busy tourist seasons. Recently, the New York Times named Bend one of 50 top travel destinations for 2015. That’s why you need to get here now, not later! Bend used to be a well-kept secret…not for long. There are 26 breweries in Central Oregon and 19 of those are in Bend. Deschutes Brewery, the fifth largest craft brewery in the United States, started in Bend in 1988. Now, the brewery which overlooks the Deschutes River in Bend’s Old Mill District, can bottle 567 bottles per minute. The water is what makes the area such a hub for breweries. Locals think Bend’s tap water tastes better than most bottled and since beer is 95% water, that should give you an idea why brewers are big on the area. 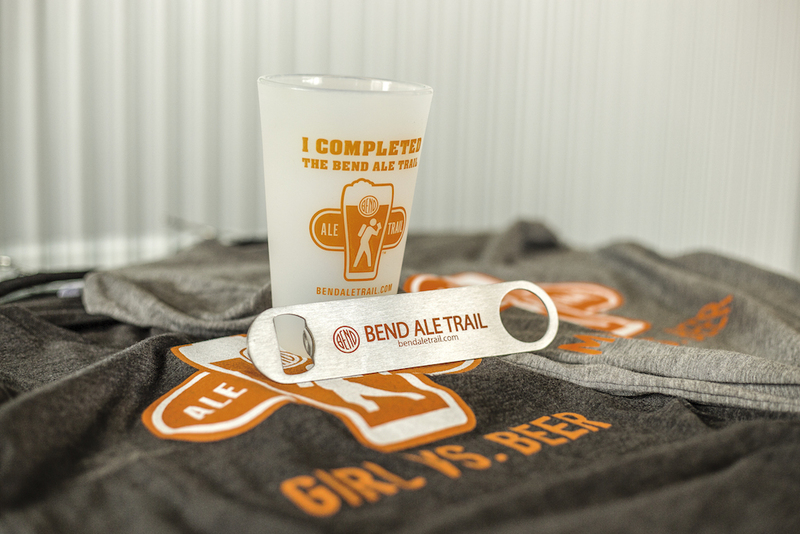 People love craft beer so much in Bend that the visitors bureau,Visit Bend, created a way to get rewarded for exploring every brewery: The Bend Ale Trail. If you’re wondering how to get around to all the breweries without landing yourself in the back of a cop car, there are tons of options that are way more exciting than a taxi. 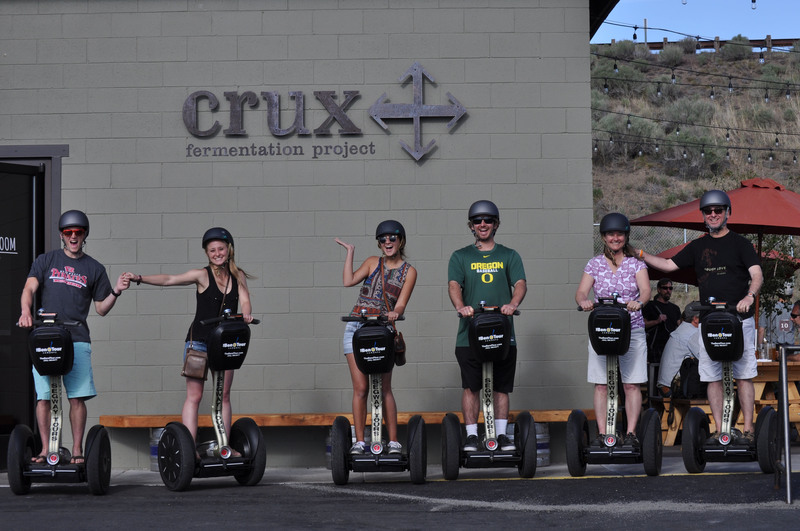 The Bend Tour Company offers Segway tours that will leave you grinning from ear to ear. All you have to do is take a test run through the practice course, throw on a helmet and you’re off! If riding bikes is more your style, hop on one of Let It Ride’s electric bikes and cruise at your own pace. Another option: Cycle Pub. 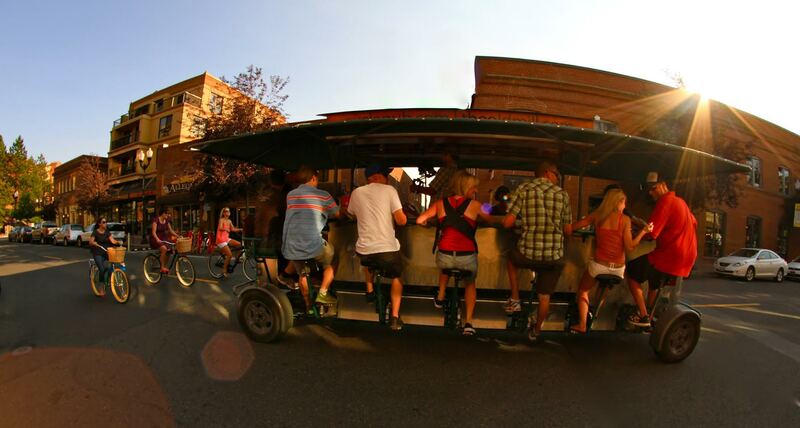 The Cycle Pub is exactly what it sounds like, a bar on wheels. It’s an easy way to get a big group to and from the breweries, plus since you’ll be using ‘pedal power’ you don’t have to worry about getting a beer belly. Get ready for your 15 minutes of fame if you choose to go the Cycle Pub route, it always garners lots of attention from bystanders as the party rolls by. 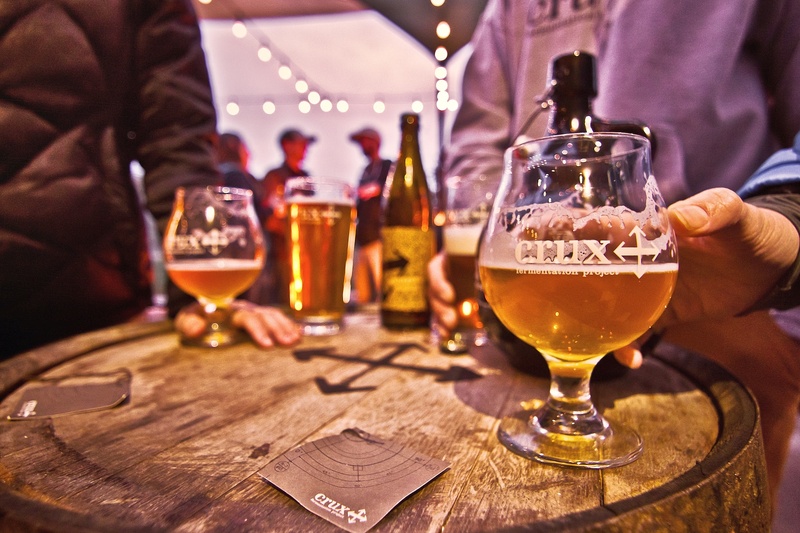 Crux Fermentation Project: Hands-down, this is the brewery to watch the sunset. Crux has a fun, relaxed vibe and a food cart, El Sancho, that slings some of the best tacos in town. GoodLife Brewing Company: During the summer GoodLife opens up their bier garden/green space where you can play bocce ball, corn hole or just hangout by the fire. Kids and dogs are welcome and there’s plenty of room for either of them to burn off some energy while you enjoy a really good beer. 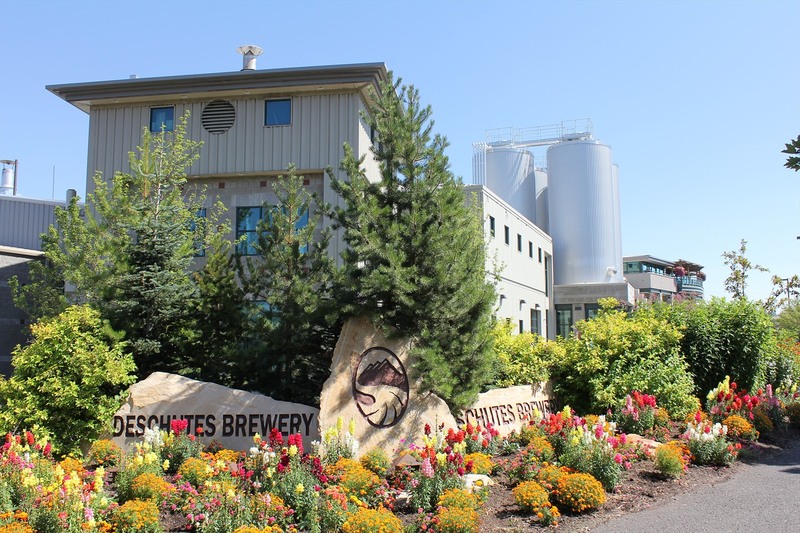 Deschutes Brewery tour: This might sound like a total tourist trap and honestly, it kind of is. Don’t let that scare you away though. The guided tour offers an insider’s look into how Deschutes does business and the ambassadors leading the tours are some of the most energetic and informative people you’ll ever have the pleasure of meeting. If that doesn’t sell you…the tour is free and you get four free samples! 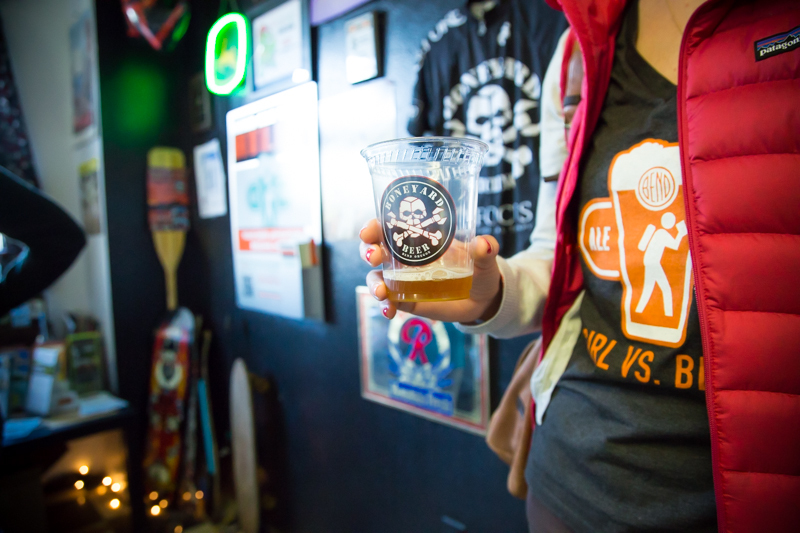 Boneyard RPM IPA: Don’t leave Bend without trying this beer from Boneyard Beer. Locals live for this perfectly balanced IPA and since Boneyard doesn’t bottle or can their beer, Bend may be your only opportunity to taste it. I can’t promise nobody will try to push a few IPAs or Porters your way, but there are plenty of other non-beer options in Central Oregon. Touring Red Tank Cider in Bend will squash any preconceived thoughts you have on cider just being apple juice for grown-ups. If you’re more into wine, check out Faith Hope & Charity Vineyards or Maragas Winery just outside of Bend for fantastic wine and amazing mountain views. Central Oregon is also home to award-winning distilleries. Not far from Bend, Bend Distillery has a tasting room with incredible views of the Cascades. You can also tour Oregon Spirit Distillers for a bourbon that will knock your socks off. Not into any type of alcohol? That’s ok! Bend-based Humm Kombucha has their own tap room where you can taste test and fill up a growler with your favorite flavor. Mackenzie Wilson is a lifestyle TV reporter and writer based in Bend, Oregon. She writes freelance for 1859 – Oregon’s Magazine and creates video content for the Central Oregon Visitors Association. A passion for storytelling mixed with a never ending list of recommendations when it comes to food or adventures led her to focus on travel and food/drink writing. Mackenzie also writes motivational and career-related blogs on her website www.mackenzie-wilson.com.